A Detroit McDonald’s employee has been fired after video of him tossing water on a homeless man caused outrage. 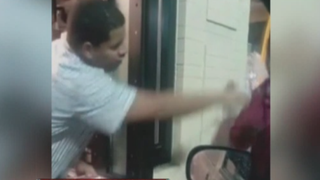 A Detroit McDonald's employee who lured an elderly homeless to the drive-up window with the promise of a sandwich, only to throw water on him, has been fired after video of the incident went viral, upsetting many who watched it. "I am very disturbed by the inappropriate behavior of this employee," McDonald's franchisee Wise Finley told the Detroit Free Press in a statement. "This type of behavior is not tolerated in my organization. I expect my employees to treat everyone with dignity and respect, and this was unacceptable. This individual no longer works for my organization." In the video, the worker leans out of the window and calls out to the man, telling him that he's going to give him a sandwich. At first the man balks at the offer, but when the worker holds up the sandwich for the man to see, he walks over. The worker then tosses a cup of water on the man, who asks, "Why'd you do that?" "I think we forget sometimes that people experiencing homelessness are just like you and I," Tasha Gray, executive director of the Homeless Action Network of Detroit, told the Free Press. "We have working families who just don't have enough means to make ends meet. I like to tell my staff that we're one missed paycheck away from homelessness." Detroit police told the newspaper that they were looking into the incident for possible assault charges. David Sampson, CEO of the homeless and addiction-treatment center Mariners Inn, also in Detroit, said that the video made him sad at first and then angry. "Those kinds of actions are unconscionable," Sampson told the newspaper. "To me it comes from a place of ignorance, not really having compassion for other people's plight. I often tell people, 'There but for the grace of God go I.' "
Read more at the Detroit Free Press.